Concord Orthopaedics' physicians provide support at the Loon Mountain First Aid station to assist anyone who may suffer an injury while on the slopes. What is the Acute Injury Clinic? The Acute Injury Clinic at Concord Orthopaedics offers walk-in and same day appointments for acute orthopaedic injuries. Our physicians each specialize in a particular area of orthopaedics, bringing the experience and focus you need to get back to what you love. We are committed to providing the highest quality of orthopaedic care available. An important part of that care is our patients' experience. Experience You Can Trust. For over 40 years, Concord Orthopaedics has been serving New Hampshire and beyond in specialized orthopaedic and arthritis care. Your goal is to get back to what you love. Our commitment is to get you there. Dr. Brendan Higgins is an Orthopaedic Surgeon whose practice focuses on the surgical and non-surgical treatment of shoulder, hip and knee disorders and traumatic injuries. He specializes in the arthroscopic treatment of sports injuries and trained directly under many of the leading pioneers in shoulder, hip and knee conditions. Dr. Higgins strives to return all patients, regardless of their age or ability level, to their desired goals, passions and pursuits. We have four convenient physician office locations and two orthopaedic surgery centers with walk-in service at the Acute Injury Clinic in Concord. Each of our physicians concentrates in his or her area of interest, developing skills and experience that would not otherwise be possible. In addition, we have more than one physician in most specialties, allowing our physicians to seek the opinions of additional experts within our practice. There is no substitute for this kind of focus and experience. It’s been great! I can’t say enough good things about Concord Orthopaedics. They are staying on top of the newest innovations and they are committed to making their patients whole again. I refer people to them all the time. Dear Dr. Mollano, I can play my guitar, do my floral design work, and stained glass. Thanks to you, I can retire and enjoy myself pain free. I hope you may find a place in your home for this stained glass piece. Enjoy it, and know how much I appreciate all that you have done for me. I want to thank you for doing such an excellent job on my shoulder. I'm so grateful that I got you as my surgeon. Your professionalism, knowledge, and awesome personality made the whole experience comfortable and easy to go thru. Again, thank you for everything you have done for me. Most people approach surgery hoping they will emerge no worse than they were before their injury or ailment. Christopher M. got that -- and then some. "Dr. Wiley is the best!" Dr. Wiley is the best! Very kind, concerned and professional. So far, he has replaced 2 hip joints and a knee. I am so pleased. "Dr. Brummett and Alan were wonderful..."
Dr. Brummett and Alan were wonderful, kept me informed, and answered all my questions. Dr. Brummett is extremely quick to respond to my post-op questions as well -awesome! "Dr. Gentchos is a fine surgeon..."
Dr. Gentchos is a fine surgeon - caring, not only with his occupation, but also with his patients and their caregivers. "Dr. Fox is the best." Dr. Fox is the best. I did a lot of research before choosing Dr. Fox. He is well worth the wait. He really gives a lot of his time with all phases. "Concord Orthopaedics - They not only do it well, they do it right." When I needed a hip replacement, I wouldn’t have gone anywhere else. Dr. Stephen Fox was my surgeon and I can’t say enough about him. His skills are superb and he cares a great deal about his patients. "Dr. Dion was caring, considerate and very pleasant." Dr. Dion was caring, considerate, and very pleasant. 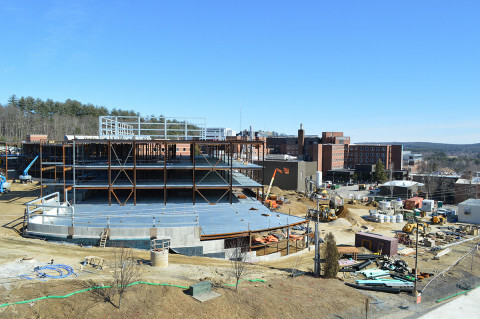 I can't say enough kind words about the care I received at Concord Orthopaedics and Concord Hospital. I've see a lot of doctors over the years and by far Dr. Wiley is one of the best! "Very confident with my son's care." Dr. Casey and Kaitlin were very friendly and personable. Very confident with my son's care. Thank you! Great visit. Great customer service. I felt that Dr. Klingler listened to my issues and offered a solution to rectify my issue. "My first visit - Dr. Gentchos was excellent." My first visit - Dr. Gentchos was excellent. He provided informative information. He took the time to explain my options very objectively. Thank you. "Dr. Shirley...I would recommend him to others." Dr. Shirley is a very kind, friendly person who goes out of his way for others and myself. I would recommend him to others. Great staff. Very attentive and caring. Always working to make sure services are provided no matter what. Dr. Fox is top-notch! Brilliant, patient and friendly. He visited me even on weekends. He made me feel secure and confident. My questions and concerns were addressed. "...appreciated the personal call from Dr. Wiley..."
Dr. Wiley and his staff are the best!! Especially appreciated the personal phone call from Dr. Wiley day prior to surgery. It really minimized the stress. From my initial consultation eight months ago, through my total hip replacement two days ago, Dr. Burns has been a caring and consummate professional. His work ethic and skill are second to none; I feel quite fortunate to have been referred to him. Additionally, my treatment at his New London location and throughout my surgery at Concord Hospital was superlative. Dr. Moran is amazing! His bedside manner makes you feel at ease and important. Your care is number one with him and getting you back to the best you can be. Dr. Brummett - reassuring and informative. Dr. Brummett and his physician assistant were very reassuring and informative. The best I could expect. Dr. Casey and his team have been wonderful. Love Dr. Burns and Karen Barry, PA. I have already shared my positive experience with others. Dr. Fox and his team were awsome!!! "Dr. Burns...did a great job...a great experience"
Dr. Burns was excellent and fit me in at little notice and did a great job...a great experience. "So Grateful to Dr. Burns..."
So grateful to Dr. Burns and his staff for putting my leg back together again. Concord Orthopaedics has been treating me for about 5 years now and have always been friendly, kind, helpful, & knowledgeable. Wonderful, informative, and answered all my questions. Dr. Brummett and Alan were wonderful, kept me informed, and answered all my questions. Dr. Brummett is extremely quick to respond to my post-op questions as well - awesome! Dr. Chris Gentchos was extremely explanatory on all options available for my foot, while listening to me fully to understand my pain and foot issue. Will highly recommend him in the future and will return for treatment. From the front desk to the doctor, everyone was friendly and professional. Concord Ortho's mission is to keep you in the game as opposed to telling you to quit playing! Thank you! Dr. Shirley is an excellent and caring doctor. He has great follow through with his patients. Extremely knowledgeable. X-Ray Technician as efficient and caring to achieve optimal positioning for best results. "Dr. Nagel took the time..."
Dr. Nagel took the time to understand my pain situation. He is very good at explanations and his expertise is obvious & praiseworthy. "Ryan calmed all of my worries..."
Dr. Fox answered all of my questions. Ryan calmed all of my worries and always got back to me ASAP. They worked together to make sure my pain meds were correct before I went home. "I did a lot of research before choosing Dr. Fox." I would never let anyone other than Dr. Noordsij touch me - he is caring and professional, to say nothing of his surgical skills - it doesn't get any better. I recommend him to everyone! Staff & medical care is SUPERB - oustanding customer service and medical care. "Addy and the staff [in New London]..."
Addy and the staff are so pleasant. The best recommendation when I call for my medications also. Dr. Hoke Shirley does excellent care. "Fast, asked the right questions..."
Fast, asked the right questions, showed concern, very professional, very informative, explained in detail what I need to do to get my health back. "...the receptionist, nursing staff, and onto the doctors, everyone is great!" I work in healthcare, so I know what to expect when I enter a healthcare facility. However, Concord Orthopaedics surprised me with how professional, caring and understanding they all are. From the receptionist to the nursing staff and onto the doctors, everyone is great! I am 60 years old and this was my first surgery. I had a total knee replacement done due to an injury and Dr. Burns was great. He put up with my dumb questions and was understanding and comforting during the entire process. Can't speak highly enough about this place. Ever so friendly staff, start to finish, front desk, nurses, assistant and Dr. Casey. "Dr. Casey & his staff are..."
Dr. Casey & his staff are very caring, efficient, always listen to the problem and wants to help solve the problem. I would highly recommend Dr. Casey. I appreciate the on-time scheduling, attention to privacy, friendliness, and the excellent medical care. "Excellent past and current experience and results." Excellent past and current experience and results. Five surgeries with Concord Orthopaedics - complete success. "I've been coming here for 19 years..."
I've been coming here for 19 years and have ALWAYS received excellent care. "Dr. Fox and Jenna John are an excellent team." Dr. Fox and Jenna John are an excellent team. They were both so caring and made me feel like I was their only patient. "Dr. Dion as very good explaining..."
Dr. Dion was very good explaining what was going to happen and describing the knee that I was getting. Could't believe he called me on Sunday to see how I was doing!! Dr. levy is top-notch. Best in his field. Thank you for your care. "Great surgery with Dr. Duffy!" "Dr. Fox does an incredible job." Dr. Fox does an incredible job. He is highly skilled. This is my second knee replacement with him and everything went exactly as he told me it would. He's the best! "Dr. Wiley is the best." Dr. Wiley is the best. Great surgeon, caring, down-to-earth. "Dr. Levy is a miracle worker!" My expectations about the result of my spinal surgery were positive before surgery and afterward (after surgery), I was relieved of all of my former pain. Dr. Levy is a miracle worker! It's the third year in a row for these four Top Docs! Congratulations to Drs. 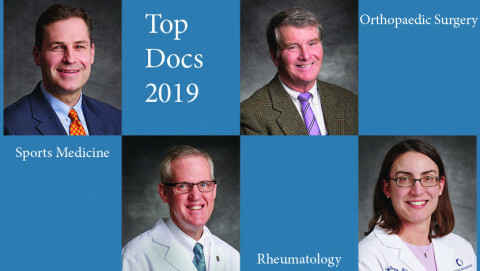 Casey, Fox, Shirley, and Orzano having been named Top Docs in New Hampshire for 2019. 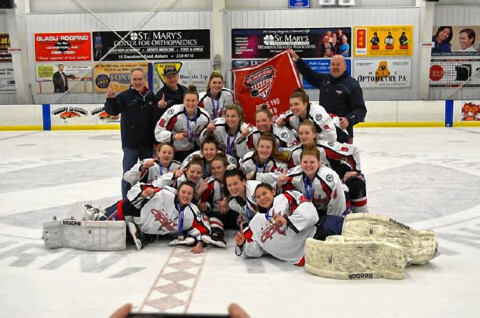 Concord Capitals Girls Hockey Going to National Championships! Concord Orthopaedics Concord Capitals 19U team is playing in the national championships for the second time in three years.